I haven’t identified any pinpointable criteria that make this group of ten, for me, winners. Except that the cover alone really makes me want to read them. Yes, the flap copy will help. But on cover alone, I want to read these. So here are the final four of my ten favorites of 2007. 1. A Field Guide to High School by Marissa Walsh (Delacorte). It’s not clear to me what makes me like this cover so much. Perhaps nostalgia or just that it’s unexpected on a novel. The fact that it really does look like a field guide is pretty cool. I will have to read it and see if the little pictures really do connect to stuff in the book. But it’s different. That’s what makes it stand out. 2. 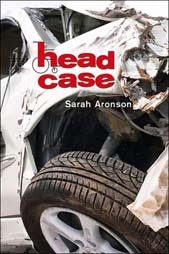 Head Case by Sarah Aronson (Roaring Brook) Jacket design by Laurent Linn. No s’mores. NO S’MORES! How could they? 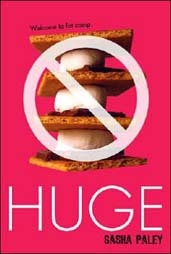 Well if you are “huge,” you probably shouldn’t eat s’mores. I am sympathetic. A big batch of marshmallow and chocolate – forbidden. I wasn’t sure about the pink, except that it really vibrates, but then I saw the paperback cover. Same idea, but nowhere near the same impact. The pink works. The text and color on the hardcover create more interest in what’s inside. 4. 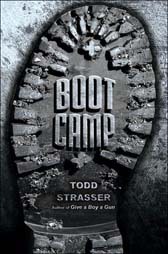 Boot Camp by Todd Strasser (Simon & Schuster) Jacket design by Einav Aviram. Jacket photograph copyright 2007 by Joel Hasen, PhD. Something tells me I shouldn’t like this. That it’s just exactly what you’d expect – cliche. But it has an in-your-face quality that seems perfect paired with the images the title conjures up. And the actual image itself is well done. Great texture, good color. Not sure I’d always be attracted to a book called “Boot Camp.” But I’ll read this one. 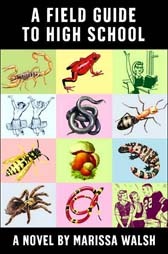 This concludes my ten favorite covers of children’s and YA novels for 2007. I suspect that anyone creating this list would come up with a completely different ten. What’s your favorite? Field Guide to High School: Andie and her best friend Bess read through a manual Andie’s Yale-bound sister wrote for her, which is filled with tips and tricks for excelling at Plumstead Country Day high school where Andie is about to be a freshman. (Age 12+) Jacket illustrations of animals and plant: Dover Publications. Jacket illustrations of people: csaimages.com. Jacket design by Angela Carlino. This entry was posted on December 20, 2007 at 2:08 am and is filed under best book jackets, book covers. You can follow any responses to this entry through the RSS 2.0 feed. You can leave a response, or trackback from your own site. Thank you so much for recognizing Laurent Linn’s extraordinary cover design for Head Case. When I first saw the design, I was obviously thrilled. Laurent clearly read and understood my book. Please tell me you have a LiveJournal feed. This blog makes me grin and I want to add it to my LJ feeds/friends. I am a bookseller and reviewer who considers this sort of thing all of the time and have written articles about it! Bravo! Huge was very good, but I was disappointed in Field Guide. I also loved the cover. It made me think of Little Golden Guides. There’s some cord it struck. And your opinions line up very well with those of my students. Am LOVING this site!